When you are in Indonesia, you have got to be in Bali. And when you are in Bali, you have got to peep into its basket of hot springs. It counts amongst the top things to do in Bali and is something which will leave you asking (make that begging) for more. Swimming in one such hot spring is a fascinating thing and a dream come true for many. Some novices may get a feel that the hot spring is a simmering body of boiling water in which swimming is akin to jumping in fire. But hey wait, it may be warm, but the water is certainly bearable and is not a pot of smoke (do you really think we would push our readers to jump in the line of fire, huh)! And on a light note, this is one ‘hot’ property you can always check out without your wife/girlfriend getting all boiled up at you. Volcano Batur is one top tourist attraction where the activities of volcano climbing and rafting are a rage. It also boasts of a natural hot water spring and is a place worth a second visit. No points for guessing, this region is one of the top draws for many Bali honeymoon packages. Banjar Hot Water is another spring which enjoys its share of tourists and swimmers. Like most hot water springs, this one too is supposed to have healing traits. So, those who have certain skin ailments or those who just wish to go for a delightful swim can include this one in their Bali wish list. 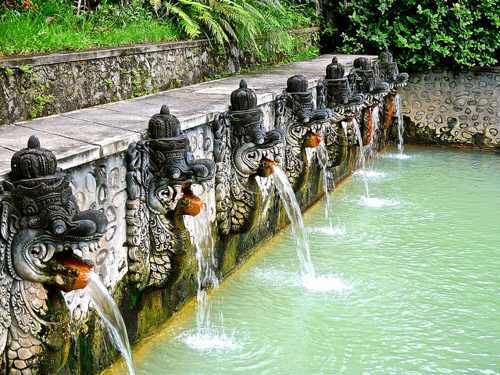 This natural spring is located nearby Wihara Temple which is another tourist attraction. It falls in the region of Singaraja which makes for a nice outing. In addition to the Banjar spring, it also has attractions like Buyan Lake, Gitgit Falls, Lovina Beach, Pulaki Temple and Tamblingan Lake to flaunt. Bali, in a nutshell, is made up of forests, caves, temples, waterfalls, seas and springs. There are a number of volcanoes as well and nature does show its true colors to its wide-eyed visitors. Miss Balishwari, our secret Bali agent, tells us that a Bali spring bath must be followed by a warm shower in your hotels. Though these springs are therapeutic, a sensitive person’s skin may not enjoy sharing the spring with dozens of other swimmers. Just in case you don’t know how to swim, simply slid down, plunge your feet and splash waters at others. This entry was posted in Bali and tagged Hot Springs in Bali. Bookmark the permalink.